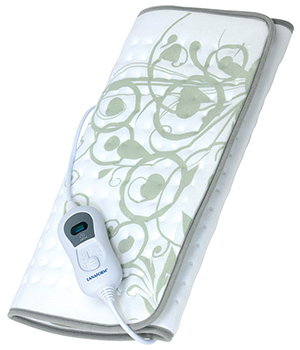 Heat pad with 3 heat settings, find your ideal temperature! Are you always cold? Even with adequate heating in your home it can feel impossible to warm up properly on cold winter days. A great way to stay warm and toasty while also saving money is a heat pad – it allows you to target warmth where you need it the most, so that you don’t need to heat your whole house as much. It’s much better than a hot water bottle or microwavable pad as it doesn’t lose heat, so you can stay snuggled up for longer. A heated pad can also be used for heat therapy; if you have arthritis, period pains or just general achiness, applying heat to the affected area will soothe and relieve your pain and reduce inflammation. Lanaform’s Heating Pad comes in a multi-functional XXL size, which allows you to use it as a pad on your bed or sofa, draped over you or even wrapped around you. This makes it perfect for warming yourself up, treating injuries, and for warming up your bed at night before you get in. The pad pre-heats to its maximum temperature in only 15 minutes; so when you’ve been out in the freezing cold and finally make it home you can feel better in no time! It can be used like an electric blanket as you drift off to sleep, keeping you at a lovely cosy temperature. For your safety and comfort, the pad will switch itself off automatically after 3 hours to avoid overheating. There are 3 heat settings so you can find the perfect level for you, selecting it with the handy remote control. Made from lovely, soft micro-fibre, the heat pad feels lovely against your skin and is machine washable. 100W / 220-140V / UK Adaptor/plug. Factory fitted, screw fixed adaptor to the EU plug. 75 x 40cm / 29.5 x 15.7"